I think it’s safe to say that most of us that work in the office, slaving away at a computer all day, yearn for something interesting and different. Something that forces you to get out of that chair and get moving. Perhaps that’s just me, but I’d like to wager that a few of you desk dwellers feel the same. I was thinking about this exact thing when I came across an infographic on Visual.ly that discussed exactly that: jobs that make you wonder if they are really things that you should be getting paid for since they are so different and “non-worky.” (I’m not sure if that’s really a word, but we’re gonna roll with it!) Not only are these jobs a far cry from the norm, but the people that hold these jobs make a good amount of dough, too! So how do you feel about cooking? How do you feel about ships? Combine those two things and you could make close to $180,000 annually. The job I’m talking about is that of a submarine cook. They cook the food that is served on the submarine- simply enough. Withing just six years though, these submarine cooks could be making as much as a junior admiral. What about diving? Have you always loved to swim? Then you may be someone that considers making oil and gas diving your career. These divers inspect and install rigs, welding or pipes for oil rigs under the sea. I’m not sure of the danger involved with this odd job, but it pays about $80,000 annually. Not too shabby, right? 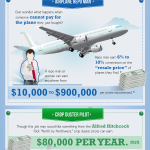 Check out the other odd jobs below in the infographic. Perhaps you’ll reconsider your hum-drum, computer toiling office job after all.